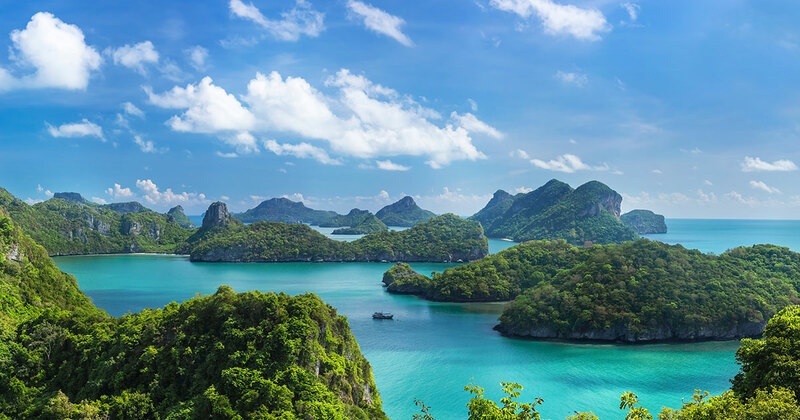 AngThong National Marine Park translates as ‘golden bowl’, occupies almost 250 sq. km and includes 50 sq. km of protected nature area consisting of over 40 islands. All of the islands are uninhabited and undeveloped except for one. This island, Koh Paluay, is inhabited by “sea-gypsies” who still earn a living from fishing. The islands resemble Koh Samui 40 years ago, prior to the arrival of tourism and modern infrastructure. The Marine Park is famous for its natural beauty untouched by development. The islands range in size from mere rocks in the deep blue sea to little paradise islands with white beaches and coconut trees. The movie ‘the Beach’ starring Leonardo Di Caprio was inspired by and partially filmed at this location. Being in the Marine Park gives you the feeling of being an explorer, discovering the far ends of the world. The water is clean, calm and inviting, creating the perfect conditions to explore the park’s hidden treasures. The best option to travel to the Marine Park is by luxury yacht as they have the capacity to reach many different locations within a brief amount of time, perfect for this wondrous destination. Being based on the West-Coast of Samui, Our yacht will take you to the Park in less than 45 minutes allowing for longer time to enjoy the Park. The First location we visit is at the North of the Park at Koh Wao which consists of three islands with a sheltered bay in between, making it well-suited for snorkeling. Our Guides will navigate you through shallow caves and introduce you to an abundance of Marine Life. After snorkeling, the yacht will take you nearby the most interesting limestone islands for a slow paced coastal cruise. Caves, hidden lagoons and white sand beaches are there to be explored. From here, almost all AngThong Marine Park tour operators go to Wua Ta Lap Island (the Park’s Visitor Center) for picnic lunch and kayaking. The visitor center is visited by many tour operators, making it very crowded. We choose instead to travel a bit farther to eat lunch and do sea kayaking at Koh Paluay’s sea gypsy village. On Koh Paluay you will have a freshly cooked buffet lunch in at the traditional Thai fisherman’s village a restaurant. After lunch, the yacht will take you the final stop at the south of the island to the secluded Song Pee Nong beach. Here you will be able to take a leisurely tour at your own pace along the coastline by sea kayak past breathtaking cliffs or relax, sunbath and swim at this amazing beach.